I think these would be perfect for a little girl’s birthday, or for your sweetheart on Valentine’s Day. No matter what the occasion, they’ll be well received. Yum. Now, can someone please come over and give me piping lessons? I promise I’ll pay you with good eats. Grrrr. Preheat oven to 350 degrees. In a medium bowl, beat sugar and butter together for 3 minutes. Add egg yolks, one at a time. Add vanilla, food coloring and strawberries, and beat for 3 minutes. Sift dry ingredients together and add to butter/egg mixture alternately with buttermilk, beginning and ending with dry ingredients. Mix until just combined. In another bowl, beat egg whites until stiff. Add to cake batter one third at a time, folding in thoroughly but gently. Pour batter evenly into 36 lined cupcake tins. Bake for approximately 18 minutes. Beat cream cheese and butter together until light and creamy, about 3 minutes. Add liquids and blend. Slowly add sugary while mixing. You need a medium stiff consistency, so add more sugar if necessary, and beat for several minutes. Frost when cupcakes are completely cooled. This entry was posted in cake, cupcakes, dessert. Bookmark the permalink. They look and I am sure they taste deliciously! I agree they are very appropriate for valentine’s! Mmm I LOVE strawberry treats! Especially cupcakes. These are so pretty-in-pink! Omg…This recipe looks to dye for! And it’s pink! My favorite color! I’m having a linky party as well, and would love for you to join it! Here is the link http://www.thesouthernproductqueen.com/one-stop-s… Thanks for sharing! Thank you for sharing this great recipe. I love strawberry, esp the sour taste. I need to try it in the weekend. I’m so happy you have this recipe on your blog! I saw it on Pinterest, but apronofgrace seems to be gone. I recommend searching youtube for videos on piping cupcakes. It’s really pretty easy once you get going. Buy the large set of tips that includes the 1M. It fits in my pastry bag without the coupling or you can use a ziploc bag with the tip cut off. With this tip, you will only need to make a couple times around the cupcake and you’re done. They will look better than most of the bakeries. You can practice on a plate, scoop it up and try again until you feel comfortable. I’m second genearation Italian and Greek too! I saw apronofgrace’s cupcake on Pinterest and the site seems to be down now. I was so happy to find your blog with the recipe. To pipe really professional looking cupcakes, buy the large set of tips. I use the 1M. 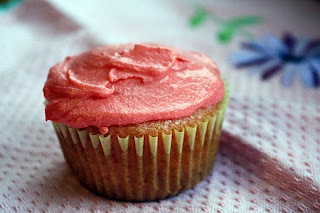 It only takes a couple of swirls around the top of the cupcake to look really good. I found my tips at Walmart, but they have them at most places that sell Wilton products. Practice a couple times on a plate until you get the hang of it. There are some really good videos on youtube. Just search for piping cupcakes. Here’s one that shows different ways to pipe them, but you don’t have to go as slow as she does. http://www.youtube.com/watch?v=mYy2uiK6T94 I’m Greek and Italian too!